Made of polycarbonate and plastic shells. Three different moulds available for individual preference. Foam padding for shock absorption and comfort. Wide range of colours available on order. - Face Mask for player to provide full protection for his eyes, head as well as full face. Fibreglass Helmet with foam padding inside, adjustable Helmet gives adequate protection to the Keeper, ideal for Ladies, Clubs & Juniors. New style protective helmet, fully adjustable for any age group. Throat protection with foam padding. 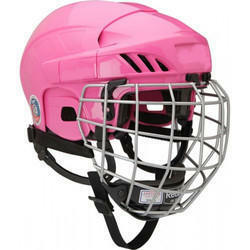 Being a customer oriented organization, we are deeply engaged in offering a wide array of Hockey Helmets. Made of high quality plastics, secondely made fiber glass. We are renowned in the art of manufacturing hockey helmets. These helmets are manufactured as per the international safety and quality standards. An utmost care is taken during their fabrication and design so as to make them convenient equipment for increased efficiency and agility of players. 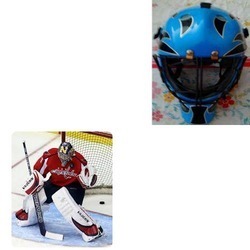 As a quality focused firm, we are engaged in offering a high quality range of Hockey Helmet. Customers are also facilitated with the availability of the Sports Promotional Items in different size, colors and dimensions to suit the requirement.